Synopsis (Goodreads): When a class war erupts inside a luxurious apartment block, modern elevators become violent battlegrounds and cocktail parties degenerate into marauding attacks on “enemy” floors. In this visionary tale, human society slips into violent reverse as once-peaceful residents, driven by primal urges, re-create a world ruled by the laws of the jungle. 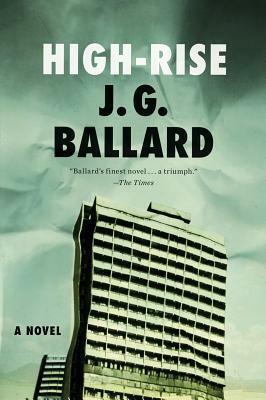 For a start I want to say that I listened to the audio-book of High-Rise. This means that I got to listen to the beautiful British voice of Tom Hiddleston. Not gonna lie, I highly enjoyed that. The book itself not so much. The story had a very interesting concept, an apartment block that has it’s own hierarchy inside of it. The way it was written, I felt like it could have executed differently and a lot better. There was a lot of repetition, listening on and on about the broken elevator, the break-ins in houses, the barricades and the rest of the mess and chaos in the building. I missed a real plot. How I looked at it, it had none. All I can think of now, is the chaos of the building and that is the whole story of the book. I had hoped for the story of someon that takes action in the building, tries to end it or takes charge, maybe interesting adventures that would have happened in the building. The ending also disappointed me. I was hoping for a certain climax, but it didn’t happen. Some things in the book were illogical to me. I could get the craze in the building, but why cut yourself completely off from the rest of the world. Food wasn’t delivered and ordered anymore and dogs were even consumed. This wasn’t needed, the whole building was starving itself for no reason. The High-Rise became more of a prison than an apartment complex in which everyone turns against each other. I gave this book 3/5 stars, which now I think about it later may even be too high. I’m not changing it, because that’s how I felt about it at the moment I finished the book.